A modern, cloud-based, more affordable solution for your hospital. Starting at $599 per bed per month. Includes maintenance, support, and hosting. See how innovative design and putting customers’ needs first creates unified patient records across all care settings, delivering the value and satisfaction other vendors only talk about. 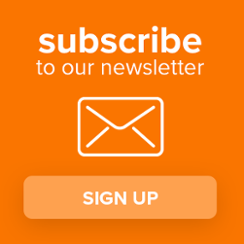 Our Acute Inpatient Solution offers a fixed-bed pricing model with no surprises, leading-edge technology, and the peace of mind that comes with a true cloud solution. Starting at only $599 per bed, per month, including maintenance, support, and hosting. You pay no upfront license fees. 20 modules cover every aspect of hospital operations, with an HTML-5 based interface available through the Chrome® browser. Available anytime, on any device. The eClinicalWorks cloud is secure, scalable, and private. Dedicated servers ensure your private data remains private. Our cloud-based solution is always on, uses 9 strategically located data centers for fast data recall, and includes the peace of mind that comes with built-in disaster recovery. Manage a list of patients in a Census List (Tracking Board) or an interactive Floor Plan view. A patient dashboard summarizes the complete episode of care. Quickly and efficiently chart the ER episode of care via macros, templates, and dictation. Manage your Labor and Delivery Census List by mother and/or baby. Users have the ability to chart a comprehensive medical record, including Delivery Record, Flowsheets, Intake/Output, OB Record, and Nursing Station Monitor (three-patient or nine-patient view). The Laboratory Information System allows you to manage inpatient and outpatient Orders, including general labs, and microbiology. The phlebotomist can manage their own work list across various departments. The LIS also integrates with industry-leading devices. Registration/ADT covers all general registration/registrar functions, including new patient registrations and updating information regarding existing patients. It includes comprehensive management and visibility of all patients, including their statuses: Admitted, Discharged, and Transferred. Revenue Cycle Management covers Claims Management, Patient Accounting, A/R Management, Denial Management, Insurance Payments, Refunds, Charge Master/Fee Schedules, etc. Timely management of all transportation requests within and between departments and units. Managers can create their own dashboards and Tracking Boards for increased visibility of the patients under their care, and see a list of available transportation personnel. Referrals management is key to delivering appropriate and quality care for each patient, particularly at points of transition between acute and ambulatory settings. Easily manage incoming and outgoing referrals across hospital departments. Better care begins with complete visibility of a patient’s medical record, whether they were admitted from the Emergency Department or another facility. Users have the ability to view all Progress Notes and nursing assessments associated with the episode of care. Manage a discharge checklist across multiple disciplines. Ability to manage orders of various types. In addition to Meds, Labs, and Radiology, users can place individual Orders or complete Order Sets for Nursing, ADT, Code Status, Allied Health, etc. We include the ability to cosign, acknowledge, and see Orders in a schedule view. The Radiology Information System allows you to manage inpatient and outpatient orders. You can manage the orders in a work list, or schedule them with radiology-based scheduling rules. The RIS also integrates with industry-leading devices. Centralized scheduling allows users to look up existing patients or create new patients, search appointments, manage new scheduling requests, and manage reschedule requests. Users can also manage scheduling of resources for clinicians, including providers, nurses, and ancillary users. Ability to manage orders, work lists, scheduling, and clinical charting across various disciplines, including Physical Therapy, Occupational Therapy, Respiratory Therapy, Speech, Dietary, Wound Care, Case Management, etc. Operationally manage various housekeeping tasks, such as bed cleaning, laundry, waste management, deliveries, etc., which need to be handled across various departments and units on either a scheduled or as-needed basis. Managers can create their own dashboards and Tracking Boards for increased visibility of available housekeeping personnel. Manage supplies and equipment, including quantities, costs, par levels, lots, expiration dates, locations, manufacturers, and suppliers. Surgeons, anesthesiologists, and nurses can see each other’s documentation throughout the case. Records are visible to all authorized care providers. Full touch-screen compatibility for intraoperative anesthesia charting. Build your own formulary, order medications (various formulation types). The pharmacy department has their own worklist to review medication requests across all hospital departments. The pharmacy solution improves workflows and integrates with industry-leading devices and vendors. Health Information Management covers Document Management, Chart Analysis, Coding & Abstraction, Action Management, and Release of Information. Clinicians can also manage their own work lists to address any deficiencies or queries. Manage analytics dashboards by department or overall hospital performance, with interactive features. Display Key Performance Indicators (clinical, financial, time-based, etc. ), as well as daily, monthly, annual, and custom reporting requirements for all departments and service lines. Build all of units (rooms/beds) across the Inpatient Department, such as Medical-Surgical, Critical Care, and Specialty units, and manage bed and patient attributes within each room/bed. Help identify patients at risk for infections, including sepsis, VTE, restraints, catheter-associated urinary tract infections (UTIs), etc. Enable care teams to effectively monitor and manage infections, including isolations and alerts. 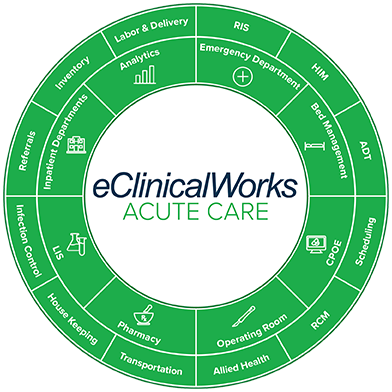 The eClinicalWorks Acute Inpatient EHR and Ambulatory EHR create one unified medical record for patients in your inpatient and outpatient communities. Enjoy secure access to the data you need, anytime, anywhere, on any device. The Acute Care EHR features a patient dashboard showing all clinical details, for Emergency Department, Operating Room, ICU, or any inpatient unit. The Ambulatory EHR handles every aspect of patient care and practice management, from scheduling, check-in and encounters through follow-up care, referrals, and prescribing.